The team of Giakhanh Hoang, Emily Shoemaker, and Jonathan Shoemaker traveled to UT Dallas to compete in The Battle of the Brains, one of the bigger computer science tournaments of the year. A total of 115 teams competed. Teams had to try to solve ten problems in three hours. Each problem required the team to write code to solve a described scenario. The code was submitted over WiFi and tested against difficult testcases provided by the judges. The programs needed to not only solve the problem in question, but needed to solve it in a time and memory efficient manner. Problems included a number theory question involving modulus operations across many different bases, a Candy Crush Simulator that required the team to correctly simulate actual games, and a chess analysis problem looking at the placement of an arbitrary number of queens on a board with over 200 million squares. As time expired, three teams, including Savio, managed to solve eight questions. The tiebreaker came down to submission time of the problems and our team finished in second. The tournament was sponsored by All-State Insurance, so the team walked away with a nice trophy, a set of medals, and each member won a set of portable speakers. The Savio Eagles football season came to a heartbreaking end on Friday as the third seeded Village Vikings of Houston handed the number 2 seeded Eagles a 21-12 playoff loss. The playoff game was the second in the short history of Savio football. Coach Gutilla was pleased with his team's season. "When I arrived at Savio, and saw only one playoff game listed on the football banner in the gym, it became a goal for us to add another. We were able to reach that goal." Coach singled out his seniors for their efforts throughout the season, and in their final game in the navy and gold. "I'm always pulling for the team to win their last game. It's tough to end with a loss, and especially hard on the seniors who have been with the team since they were freshmen. Mitchell Romero, Cory Hofmeister, and Nathan Carroll are three of those seniors. The other seniors who made valuable contributions and will be missed are Will Bradley, Grant Nolette, Tyler Bednarz, and Zack Veenis." The football team will hold its awards dinner on Wednesday, November 9th at the St. Thomas More PAC starting at 6 pm. 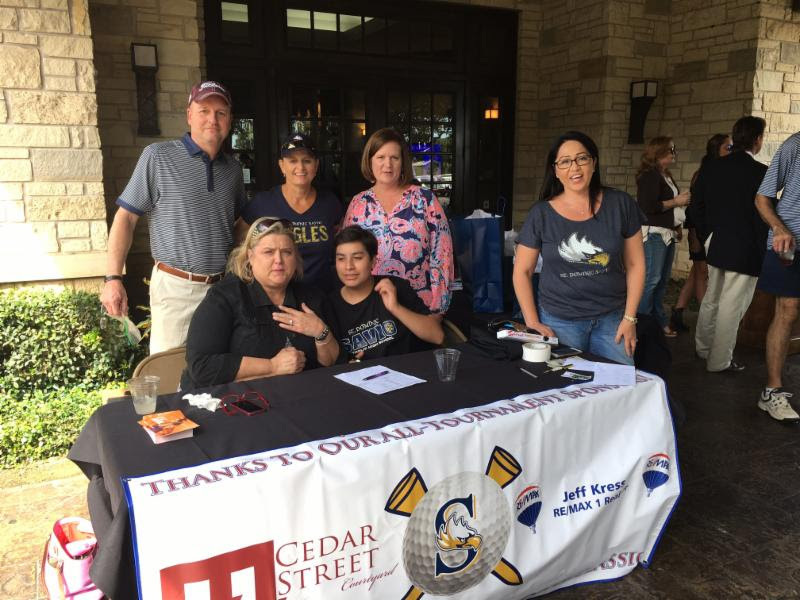 Golfers of all ages hit the course at Avery Ranch on Friday, Oct 14, in support of St. Dominic Savio Athletics! The St. Dominic Savio Eagles denied St. John XXIII a chance to make the playoffs on Friday night, and in the meantime finished the regular season with a 5-4 record and a hard-fought 13-7 win on Senior Night. The victory propels the Eagles into the playoffs as the number 3 seed, and will play the 6-3 Village School Vikings from Houston. Although TAPPS rules mandate that the game be held at a neutral site the Eagles will be considered the home team. The Eagles and Vikings will do battle this Friday at Giddings High School starting at 7 pm. This playoff game will mark the second time in school history that an Eagle football team has qualified for a playoff. In 2011 Savio qualified for a bi-district playoff spot. This year the Eagles jump right into a semi-final game. The winner of this Friday's game will play for the TAPPS Independent Division Championship on Saturday, November 5th against the El Paso Cathedral / San Antonio T.M.I. semi-final winner. Friday night it was the Eagles defense that turned in a gritty performance holding St. John XXIII scoreless until late in the game. Savio attempted to go for a fourth and four from midfield with 2:15 left to ice the game but came up less than a foot short. St. John took advantage and finally scored with a little over a minute left in the game. However, on the ensuing onside kick senior Nathan Carroll fittingly grabbed the bouncing ball and ended the St. John threat. The Eagles killed the remaining time to notch the victory, and the playoff celebration began with the students and football team singing the school fight song. The seven Savio seniors played big roles in the team's success. Captains Will Bradley, Grant Nolette, Mitch Romero, and Cory Hofmeister along with Carroll, Tyler Bednarz, and Zack Veenis made their presence known throughout the game. Junior QB Clay Orrison had his best night completing 9 of 10 passes for 147 yards and accounted for both Eagle scores by throwing an 18 yard strike to junior running back Skyler Robinson, and running one in himself from 8 yards out. Robinson also rushed for 74 yards. Congratulations to the Lady Eagle volleyball team for defeating St. Michael's last night! The lady Eagles won the first match, and quickly went down 2-1 , but with a fantastic team effort, they battled back to take games 4&5. What a way to end the season on Sr Night!! Freshmen and JV also took home the wins pushing each of their sets to 3 games! 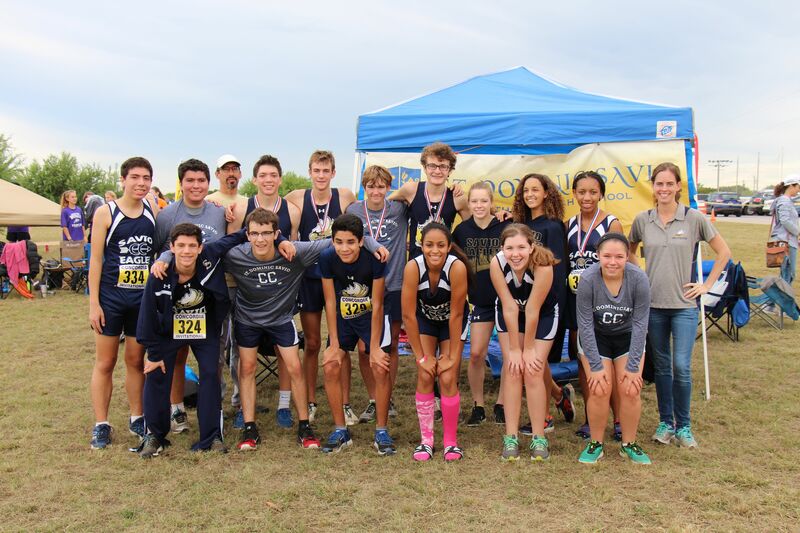 St. Dominic Savio Catholic High School Athletic Department would like to extend an invitation to your boy’s and girl’s track team to attend the St. Dominic Savio Catholic High School’s 1st Annual “Early Bird Relays” on Saturday February 11th, 2017 at the Vista Ridge High School stadium in Cedar Park, Texas. We would like to make this meet competitive and a great opportunity for your athletes to start off their track season. We will have electronic timing, coach and volunteer hospitality area, both breakfast and lunch, and concessions for the fans. Entries/results will be on Coach O. Since this is our first year, we will not exceed 12 teams. The Eagles dropped a tough 26-16 decision to Leander Glenn last Friday. The Savio Eagles will host Independent Division foe St. John XXIII of Katy on Friday night at Westwood HS starting at 7 pm. The 4-4 Eagles are looking to rebound and gain some much needed momentum for the playoffs. The first round playoff game will be held on Saturday, October 29 at a site and time to be determined. 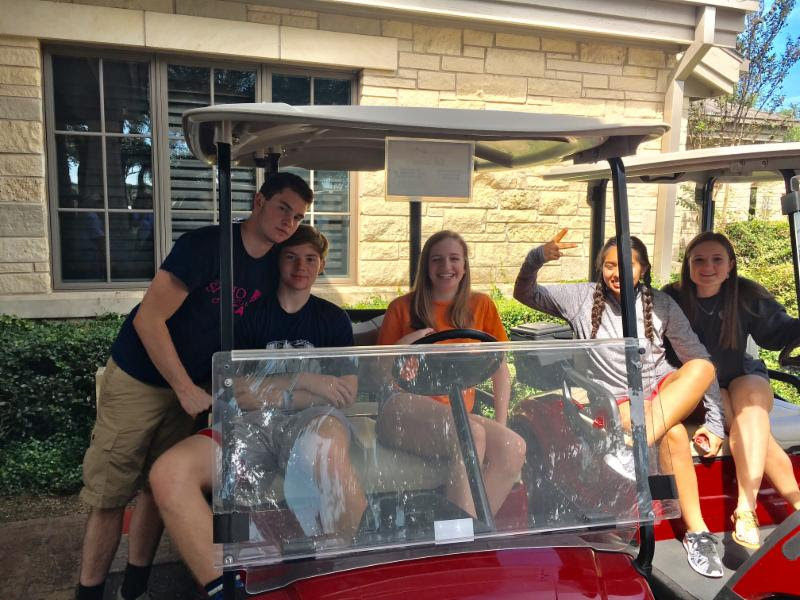 The St. Dominic Savio Computer Science Team traveled to Frisco to compete in the First Bytes Computer Science Tournament. 105 teams competed, including some of the top teams in the state. Teams had two hours to solve six complex problems using Java. Emily Shoemaker and Jonathan Shoemaker represented Savio in the competition and our team was placed in the advanced division due to past successes. Plano West High School jumped out to an early lead, but were ultimately unable to solve one of the problems. Only Savio and perennial power Richardson High School managed to solve all six problems, and our team managed to finish eight minutes faster to win the title. It was a great start to the competitive computer science season, and hopefully the first of many successful tournaments. St. Dominic Savio's varsity football team put an exclamation point on Homecoming 2016 beating San Antonio T.M.I. 49-23 in front of the enthusiastic and spirited Homecoming crowd, and clinching a TAPPS Independent Division playoff spot. Led by the all-around play of junior Mark Lacayo the Eagles overcame a sluggish start to run their season record to 4-3, and set the stage for the final two regular season games, and prepare themselves for a state playoff appearance. Lacayo returned to action in grand style after an injury he suffered in the Salado game. The 6'1 junior rushed for 151 yards, returned kicks, and made his presence felt on defense. The Eagle offense amassed 502 total offense yards, and the defense held the T.M.I. passing game in check limiting the Panthers to 88 yards. The defense also recorded a safety. TAPPS football tournament brackets were released on Saturday. The Division V Independent first playoff date is SATURDAY, OCTOBER 29 at a site and time TBD. The Championship game will be held on SATURDAY, NOVEMBER 5 also at a site and time TBD. Friday the Eagles will take on Leander Glenn HS. Glenn is in it's first year of existence as a school, and in its first year playing football. The game was originally scheduled for Westwood HS but with a very large crowd expected the game has been moved to the Glenn HS campus stadium to accommodate the numbers. Tom Glenn HS is located on the corner of Baghdad Road and Collaborative Way in Leander. Calling all Golfers to Our Annual Fund Raiser for Savio Athletics! Entertain your colleagues, invite family members! Come out as a community in support of your Eagles! It takes a community and we need your help! We are also in need of donations for our raffle and prizes. Electronics, Gift cards, Experiences! If you work with any companies that can help in these areas, please let us know ASAP! Thank you for supporting your Savio Eagles! 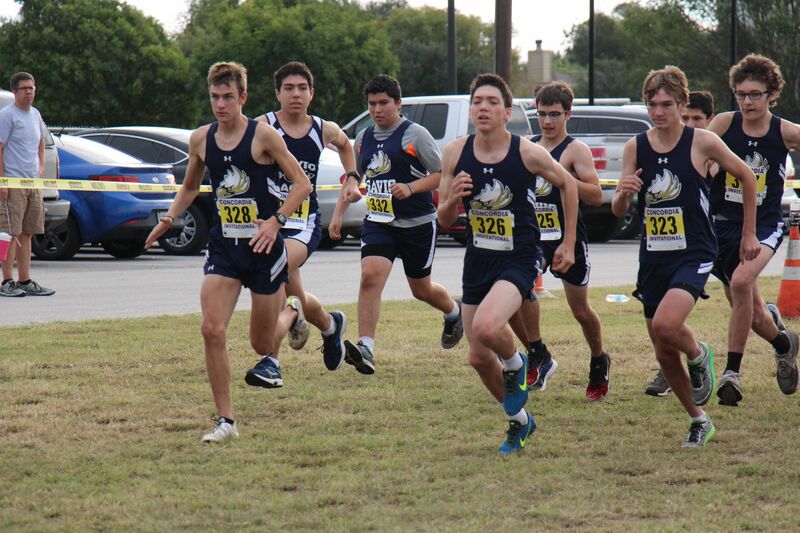 Great Job to the St. Dominic Savio Cross-Country team on Saturday, Oct 1 at the Concordia Invitational! 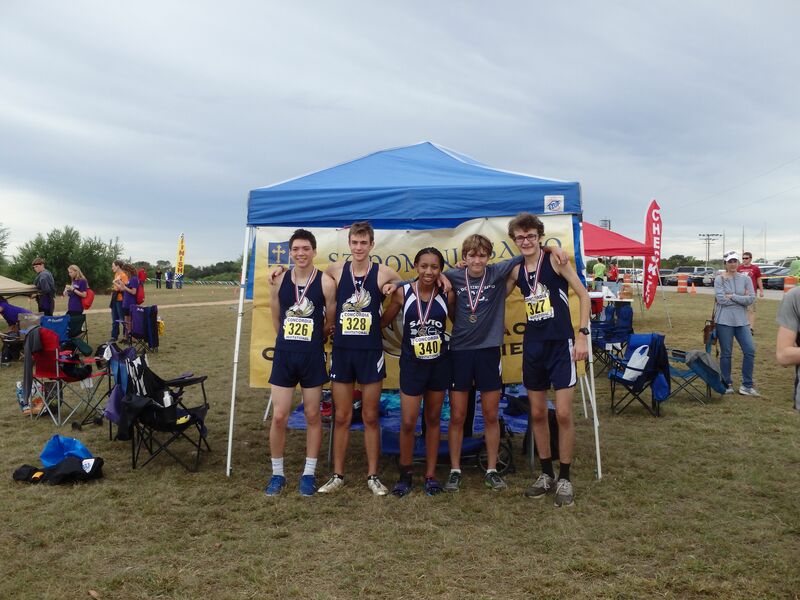 Four of our Varsity boys placed in the top ten with medals for their 3 mile race! Daniel Zamora came in 4th place for the 3 mile with a fantastic time of 18 mins, followed by Joseph Prybla in 6th place at 18:42, Christopher Reeve in 7thplace at 19:24, and Ben Frey at 10th place with a 20:13! One of our Varsity girls, Ellee’ Bartholomew, also placed in the top ten with a medal in their two mile race, coming in at number 8 with an impressive 14:21. Another one of our girls, Stephanie Wilhite came in just a few seconds after the 10th runner with a 14:38 in 11th place! All of our girls and boys had an excellent race. The whole team has been working very hard this season, with many of our runners earning new personal records each week! 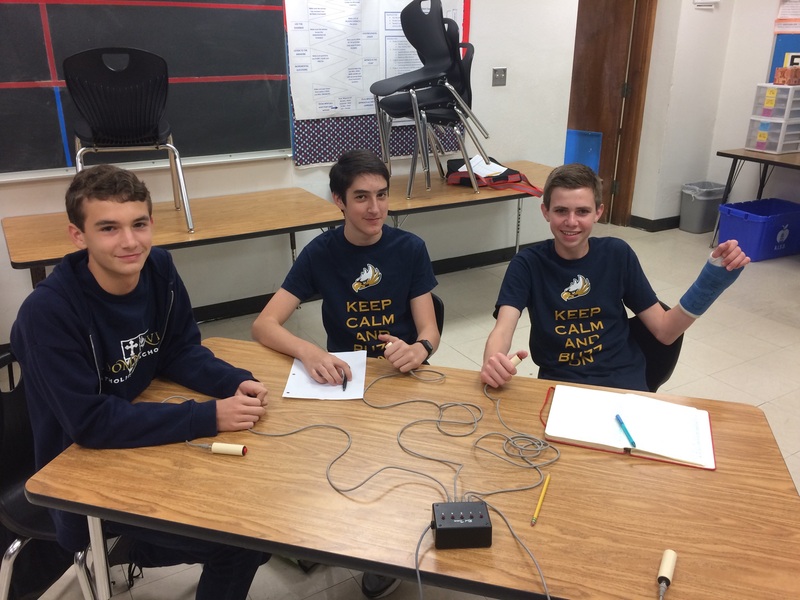 On Saturday Oct 1st Savio sophomores Nicholas Huth, Matthew Meskill, and Jonathan Shoemaker teamed up with freshman Connor Buchanan in the JV high school division of the Falcon Fest Quiz Bowl tournament at Fulmore Middle School in Austin. It was the first tournament of the year for the Eagle Quiz Bowlers and Connor's first ever Quiz Bowl event. The Savio team was impressive from the start posting a 4-1 record in the preliminary rounds, winning by an average score of 331-189. The noteworthy preliminary matches were against the three LASA teams in the event, with the Eagles posting a 330-115 victory over LASA B in the day's first match. The third match of the day was against LASA A. It was back and forth thru the first half of the match. Connor powered a question about the Bruce Lee film "Enter the Dragon", and after the team picked up 20 of the 30 bonus points the Eagles led 155-150. But the second half belonged to the LASA A squad as they outscored Savio 180-70 to claim the win. The preliminary match against LASA C was also a tale of two halves, just like the match against LASA A. The LASA squad seemed in control with a 140-60 halftime lead. But Matthew caught fire, getting six out of the first seven tossups to start the second half, including three powers, giving the Eagles a 275-180 lead going into tossup number 18. LASA closed the gap to 275-215, but Jonathan powered a question on electronegativity to slam the door shut, and the Eagles prevailed by a score of 310-250. At the end of the preliminary rounds, Savio, LASA A and LASA C all had identical 4-1 records. Bonus conversion average was used to break the tie, so going into the playoff round LASA C was seeded first, Savio second, and LASA A third. The high seed earned the Eagles a bye until the semi-final round. In the semi-finals they faced the one team who had beaten them in the prelims, LASA A. It was again a tight battle thru the first half with Savio in the lead 155-145 at intermission. In the second half the Eagles were able to build a lead of as much as 50 points, but the LASA team kept coming back and closing the gap. LASA finally caught the Eagles to take a 275-260 lead going into toss-up 18. But Matthew once again put his foot down, closing out the game by getting the last three toss-ups and giving the Savio squad a 350-275 victory and sending them into the championship match. Their opponent in the championship match was number one seeded LASA C team. The first half of the match could not have gone much better for the Savio team. The LASA team negged on two of the first three tossups and the Eagles jumped out to an early 95 to -10 lead. Savio's lead grew to 175-30 going into toss-up number 10. But the LASA team powered that toss-up and took all 30 bonus points to pull to within 100 at 175-75 at halftime. Unfortunately for the Savio team, this match was also a tale of two halves, and the Eagles were on the wrong end of it this time. Their lead evaporated in the second half as the LASA squad took five of the first seven toss-ups of the second half, and pulled ahead by a score of 245-225 on toss-up number 17. 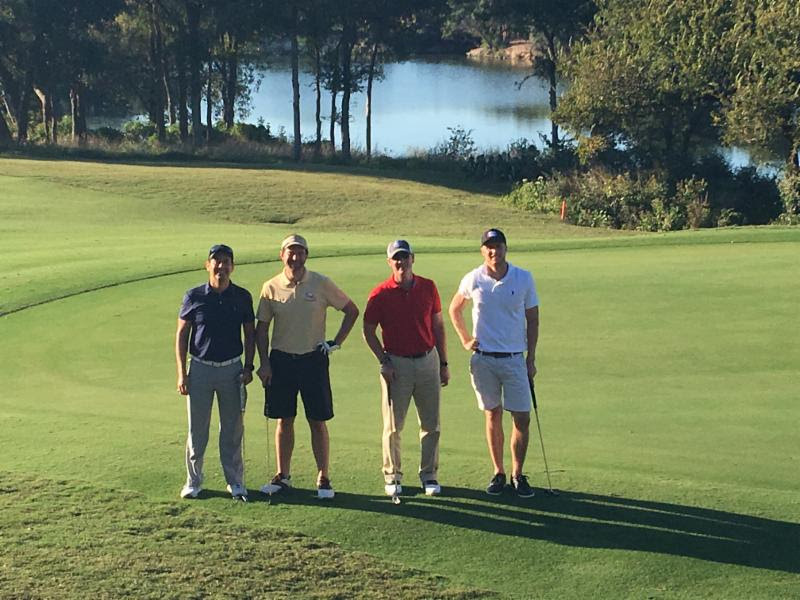 With three toss-ups remaining, it was still either team's match to win. But the LASA squad was just too strong as they powered two of the last three toss-ups and grabbed 80 of the 90 bonus points. Final score LASA C 365 Savio 225. In spite of the championship match loss the Eagles had a great day. A 5-2 record, including three wins over LASA teams, is an achievement to be proud of. Matthew Meskill led the scoring for the Savio team with 57.86 points per game (11 powers and 4 NEG5's) and was also the number two scorer overall in the tournament. The state's Class 2A second ranked Thrall Tigers wasted no time in dashing any Savio upset plans scoring two quick TD's in the first 8 minutes of the game on Friday and cruising to a convincing 41-0 win over the Eagles. Down 14-0 Savio threatened to score in the second quarter after putting together a nice 65 yard drive but failed to convert a screen pass on fourth down from the Thrall 15 yard line ending any Eagle hopes to gain some momentum. This Friday the Eagles play host to TAPPS Independent Division foe T.M.I. for Homecoming. Currently Savio (3-3), and T.M.I. (2-3) are fighting for playoff positions. The Eagles are in third place and T.M.I in fourth behind Houston Village (4-2) and undefeated front-runner El Paso Cathedral (6-0). A win over T.M.I. and a win over Katy St. John XXIII on October 21st would secure the Eagles a playoff berth. Friday's Homecoming game will be played at Westwood High School starting at 7 pm.